Tales of Phantasia was a Japanese-made RPG originally released on the Super Nintendo in 1995. 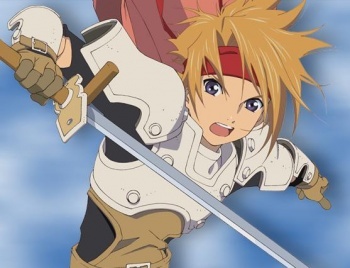 Since then, Phantasia has spawned a whole series of popular RPGs called the "Tales series," and has been re-released on three different platforms. Given the popularity of the game, and that basing anime series off of video games is a common practice in Japan, an anime adaptation was practically inevitable. Unfortunately, Tales of Phantasia: The Animation doesn't live up to the original's legacy. The problem is immediately apparent at the beginning of the four-episode series, where the viewer is literally dropped into what seems like the climax of a story arc, with two of the series' protagonists - the swordsman Cress and the cleric Mint - captured by an armor-clad man called Mars. Mars uses two magical pendants he stole from the heroes to resurrect the demon king Dhaos in the hopes that Dhaos would lend him his power. Naturally, he's dead within the first five minutes, and the demon king turns his attention to our heroes. A man named Morrison offers to send them back in time a hundred years to find two powerful mages named Claus and Arche, who supposedly have the power to defeat Dhaos. The third protagonist, the bow-wielding Chester, decides to stay and buy Cress and Mint some time, and the two escape to the past. They eventually find Claus and Arche, and they set out to stop Dhaos from destroying the world. If the above seems jumbled or confusing, it's with good reason. Most of the elements of the beginning of the first episode seem like they were supposed to have been introduced beforehand. It's as if the beginning was just left out to make room for the rest of the plot. To make matters worse, there isn't even a flashback sequence that adequately explains everything - leaving the viewer to wonder how exactly the adventure even started. This sets the standard for the rest of the series: The plot is a complete mess. Frequently, the protagonists are suddenly going somewhere or doing something for no apparent reason, and various plot-advancing devices and weapons appear at unbelievably convenient times. The protagonists also travel through time on three separate occasions, meaning they spend so little time in each era that one can never really get a feel for any of them. This is all very unfortunate, because at times I could see glimpses of genuinely interesting plot elements, but these were quickly stifled by the confusingly-paced plot. If anything, the whole series feels like a sequence of cut-scenes that have been loosely strewn together - interesting at some points, but lacking the supporting scenes that tie the story together. The characters are likewise not very well developed. Flashback sequences show Cress and Chester's village being burned by Mars, which led to the death of Cress' parents and Chester's sister. This explains something about their relationship, but that's about it for character backgrounds - virtually nothing is mentioned about the other characters' pasts. A romantic relationship is hinted at between Chester and Arche, but with the length of the series, it never has a chance to develop into anything concrete. As far as the antagonists go, Dhaos has his fair share of standard evil villain deeds. However, an attempt is made to cast him in a somewhat sympathetic light - he's almost always saying something to the effect of "humans hate what they don't understand and call them 'demons.'" Unfortunately, any sort of sympathy or logic that this rhetoric is supposed to evoke is immediately obliterated as Dhaos runs around the countryside with a giant demon army killing everything. This is drawn to an absurd level when he argues with the protagonists and they actually have a crisis of faith over it, wondering if they're doing the right thing despite the aforementioned genocidal killing spree. I know an ideological conflict between the protagonists and the antagonists is often a key component to a story, but when the logic is so bad that it breaks suspension of disbelief, it's not really worth it. On the bright side, the animation is well done, with smooth and fluid fight scenes and vivid landscapes and environments. The soundtrack is not particularly notable, but the dubbing is good, with several high profile voice actors such as Johnny Yong Bosch and Steven Blum lending their talents to the English dub. Unfortunately, this does little to make up for the haphazardly strewn-together plot. Bottom Line: Ultimately, Tales of Phantasia: The Animation is just too short for its own good. Compressing the plot of the entire RPG into four episodes simply wasn't doable, and the result is a mess of scenes that are hard-pressed to fit together logically. Had the animation team been given 13 or 26 episodes, I have a feeling the result would have been much different. Recommendation: If you've played the Tales of Phantasia RPG or one of its remakes, you may be able to fill in the blanks and get something out of this anime. If you're a newcomer to the franchise, however, the constant plot jumps and lackluster character development will likely keep you more confused than entertained. Josh Viel wishes he had a time machine, so he could steal donuts from the future.